A Russian Soyuz rocket carrying three crew members bound for the International Space Station blasted off from the Baikonur Cosmodrome in Kazakhstan Wednesday, kicking off a two-day flight to catch up and dock with the orbital lab complex. With Russian commander Dmitry "Dima" Kondratyev at the controls, the booster's first-stage engines roared to life on time and the rocket lifted off at 2:09:25 p.m. EST (1:09 a.m. Thursday local time), quickly climbing away from the same pad used by Yuri Gagarin at the dawn of the space age 50 years ago next April. Live television shots from inside the cabin showed Kondratyev in the capsule's center seat, flanked by Italian astronaut Paolo Nespoli on his left and NASA astronaut Catherine "Cady" Coleman on his right. 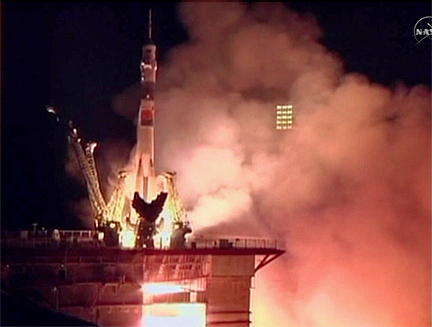 All three appeared relaxed and in good spirits as the rocket streaked toward space. Nine-and-a-half minutes later, the Soyuz TMA-20 capsule separated from the rocket's third stage and slipped into its planned preliminary orbit. Solar arrays and antennas deployed a few moments later and Russian flight controllers said the spacecraft was healthy and on course for a docking with the International Space Station around 3:12 p.m. Friday. "Everything's good on our side, congratulations on the successful orbital insertion," chief flight director Vladimir Solovyov radioed after engineers assessed telemetry. "Everything looks good, everything pressurized as it was supposed to and the telemetry is nominal." "OK, thank you for your good wishes," Kondratyev replied. Nespoli, a European Space Agency astronaut who flew aboard the space shuttle in 2007, is serving as flight engineer for the trip to the station, assisted by Coleman, a mother and retired Air Force colonel who flew aboard the shuttle in 1995 and 1999 and holds a doctorate in polymer science and engineering. She celebrated her 50th birthday Tuesday. 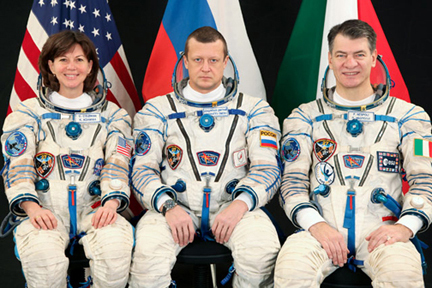 "As the right seater, I don't have as many duties (during launch) and so I have a chance to watch these two at work and it's fascinating to see them solve problems together, usually in Russian, some English, I'm not sure we ever actually know what language we speak together," Coleman said during a pre-launch photo opportunity at Baikonur. "But we do those things together and like a family, a little bit like brothers and sisters. It's quite a feat and Dima is a supreme leader in that capsule. I think Paolo and I feel very privileged to fly with someone with such good skills. My mother is glad (he has) those skills as well!" Coleman and her crewmates have been in mission-specific training for more than two years, Nespoli said, "and I'm telling you that I wake up in the morning or the night and I don't know where I am, if I am in Russia or in Europe or in Japan or Canada; I don't even know most of the time what I'm doing that day! I have to look up my schedule and figure out where I'm going! "This just shows the complications of the missions that we do now. 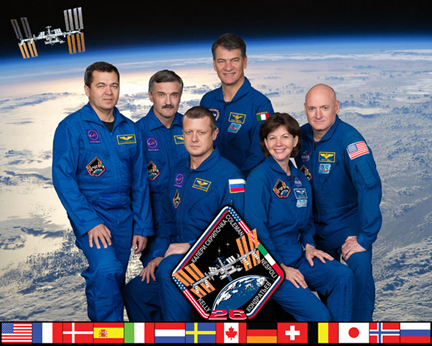 They have never been simple missions, but the station, a six-month long-duration mission, it's a complicated affair. It takes two years of training just to learn what's going on." If all goes well, Kondratyev will oversee an automated docking with the space station's Rassvet mini-research module Friday afternoon. Waiting to welcome them aboard will be Expedition 26 commander Scott Kelly, Alexander Kaleri and Oleg Skripochka, who were launched to the station Oct. 7. As soon as they get on board, my primary goal is to get them acclimated to the environment and get them comfortable enough to where they can work up here efficiently," Kelly told a reporter. "One of the first things we do is a safety briefing, make sure they're aware and reminded of all the safety training they've had, but see it from the perspective of being on board here. Really, just to get them comfortable and ready to work starting the following Monday." The six-member Expedition 26 crew faces a busy timeline that includes research, normal maintenance, two Russian-segment spacewalks and work to unload a variety of supply ships. A Japanese HTV cargo craft is scheduled to arrive in late January, followed by a Russian Progress supply ship, the shuttle Discovery in early February and a European Automated Transfer Vehicle, or ATV, at the end of the month that will deliver another load of supplies and equipment. The shuttle Endeavour is scheduled to show up in early April along with another Progress later that month. "There's a lot on our plate," Kelly said. "A lot of it is logistics, with these cargo vehicles coming up and preparing the space station for its future beyond shuttle and all the science, not only the science that we conduct now but the science we'll be able to conduct here for the next 10 years aboard the International Space Station." Along with the government-sponsored supply ships and crew rotation flights, Coleman, Nespoli and Kondratyev also may get a chance to oversee the first visit by a commercial cargo craft, the Dragon capsule developed by SpaceX. The company carried out a successful test flight earlier this month and is pushing to combine the next two test flights into a single mission that would deliver supplies to the station next spring or summer. "We will have multiple resupply vehicles from different nations coming to the station: We will have, of course, the Russian Progress cargo vehicle, but we will have ATV, which is the European Automated Transfer Vehicle; we will have a Japanese vehicle; we will have even a commercial vehicle coming, buzzing the station, just to check that everything is OK for continuing this program," Nespoli said. "So there are a lot of things happening." The Japanese HTV and the SpaceX Dragon capsule are both designed to approach the station autonomously and then to stand by while the station's robot arm locks on and maneuvers them to a docking port. Coleman said the crew is well trained in robotics, including procedures to grapple a Dragon capsule. "We will be very prepared if they decide to make that a docking mission," she said. "Paolo and I have been training extensively for both the Dragon and the HTV, the Japanese supply vehicle. Both get captured by the robotic arm. They're different vehicles, but the principle is the same for our duties so we are, indeed, prepared for that and spent a long time thinking about, from a space station point of view, what do we need to understand about these vehicles and their approach to know that on board the station we're safe?" Kelly, Kaleri and Skripochka are scheduled to return to Earth in the Soyuz TMA-01M spacecraft on March 16, leaving Kondratyev, Coleman and Nespoli behind as the core members of the Expedition 27 crew. They will be joined on April 1 by Alexander Samokutyaev, Andrei Borisenko and Ronald Garan, scheduled for launch March 30 aboard the Soyuz TMA-21 spacecraft. On April 12, the Expedition 27 crew will mark two major space anniversaries: the 50th anniversary of Gagarin's launch to become the first man in space; and the 30th anniversary of the shuttle Columbia's launch on that program's first mission. "It's going to be great to be on board when basically everybody thinks about the fact that 50 years ago Yuri Gagarin made his first flight, and now we think that living and working in space is part of everyday life," Coleman said in a NASA interview. "I think anniversaries are special because it makes us stop and think about our perspective, and realize that we've come a long way and that some of the roads ahead that might look difficult or daunting are roads that we should precede because we can make these things happen. "Look at these hard things that we made happen, when you think about the fact that the shuttle program started 30 years ago and look at all the special, special kinds of things that have resulted from the fact that we, as a world, as a country, made a space shuttle that can bring both people and amazing equipment up to space." Coleman's husband, glass artist Josh Simpson, and the couple's son, Jamey, flew to Baikonur to witness the Soyuz TMA-20 launching. "It's amazing," Simpson told a NASA interviewer at the launch pad. "Of course, the Kennedy Space Center is the same way, there's a great deal of history there. But this is THE spot where Yuri Gagarin left from and where Sputnik left from and where my sweetheart is going to go. "It's been Cady's goal to do a long-duration mission for years and I'm just so pleased for her and so happy. We'll miss her, my two sons and I will miss her. But we're actually looking forward to her giving us random phone calls and seeing her on Skype every now and then."